One of today’s growing and popular living trends for seniors, retirees and baby boomers is aging in place or preparing to age in place. This senior living trend allows people to grow old in a comfortable and safe environment they are familiar with instead of moving in with family members or heading to a nursing home. There are many ways to assess your current living environment and prepare for a time when you might need a little assistance or services to allow you to live independently in your home. When assessing your current living environment, it is necessary to examine all the major areas of your home including bedrooms, bathrooms, entries and even the yard. It is also pertinent that you take a look at the surrounding community and see what facilities, services and thoughtful extras it may offer that will allow you to live on your own for as long as possible. 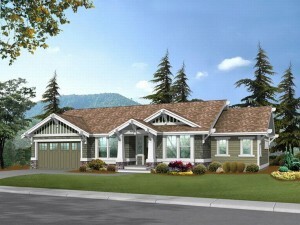 Below are some tips from The House Plan Shop to help you create a plan for aging in place. · Install good lighting. Proper lighting is necessary in all living spaces and surrounding outdoor areas including bedrooms, bathrooms, closets, gathering spaces, kitchen, laundry room, hallways, stairways, porches, garage, sidewalks, and the driveway. Proper lighting is necessary if you wish to avoid accidents such as tripping and falling. · Consider adding a garage lift. A garage lift helps those who use wheelchairs gain access to the home from inside the garage where one or more steps are necessary to enter the home. · Assess porches. Make sure all porches (front, back and any side porches) have a safe, non-slippery surface. Add rails and/or ramps where necessary for easy and safe access. · Inspect and upgrade your entry. The entry to your home is your doorway to the rest of the world. It should be convenient and safe to use no matter the time of day, what the weather may be, or what your physical ability or condition may be. A barrier-free entry makes it easy to gain access to the home whether walking through the door unassisted, using a wheelchair, crutches, or the like. No step entries have no steps from the driveway to the walkway to the front door, and they have very little slope, if any, easily accommodating someone using a wheelchair or who has trouble climbing steps. If your home has steps, consider replacing them with a ramp. · Check your thresholds. Remove thresholds from entries and rooms that are divided by a threshold to eliminate tripping hazards. · Modify your kitchen. Ensure there is ample space to maneuver. This may mean removing a few cabinets, a snack bar, or even an island sometime in the future. Consider varying heights of countertops. Lower countertops work well for rolling right up to the counter in a wheelchair, but require leg space underneath. (This can also be done with cooking surfaces and the sink. Allow knee clearance for the sink.) Taller countertops, such as bar height, allow you to stand at the counter and chop veggies, etc., without bending forward the slightest bit, ideal for those with back problems. Mount a microwave or wall oven at a reachable height instead of high over the counter top or stove. Add a raised dishwasher that allows you to load and unload dishes without stooping over. · Make adjustments in the bedroom. Be sure there is ample maneuvering space. This may require a different furniture arrangement, but more space to move eliminates tripping and other accidents. Also, build a walk-in closet or remodel the one you have. Be sure to add storage at different heights making things easy to access no matter what your condition or ability. · Survey the great room. Make sure the furniture arrangement allows for maximum maneuverability. Remove area rugs that create varied heights on the walking surface eliminating tripping hazards. Also, be sure lamp cords are tucked away so you don’t trip on them. If you store magazines in a basket on the floor, consider putting it in a place that does not hinder traffic such as under an end table. · Modify the bathroom. Hire a professional to remodel your bathroom. Make sure there is plenty of room to maneuver. 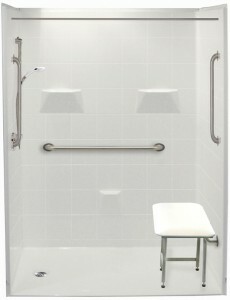 Install a roll-in/walk-in shower with multiple showerheads at adjustable heights. Install and elevated toilet. Add grab bars by each bathroom facility (sink, shower, toilet). Lower the bathroom sink and allow knee space below so you can add a bench to sit on if necessary or roll up to the sink with a wheelchair. · Consider your gardening hobby. If you enjoy maintaining a vegetable or flower garden, you might consider raising your beds. Raised garden beds reduce stress and fatigue of bending over for long periods of time allowing you to enjoy your gardening hobby without physical stress for years to come. · Learn about community services. Find out if your local community offers a transportation service such as a van or small bus to take residents to the bank, grocery store, doctor appointments, social activities, etc., in the event you are no longer able to drive. · Drive around the neighborhood and pay attention to sidewalks and street crossings. Are they safe for wheel chairs or scooters? One day you may find you need to rely on one of these to get around the neighborhood, and safe sidewalks and street crossings will be necessary. · Assess your finances. If you are set financially, make arrangements or set aside some money for home health services, cleaning and/or laundry services, should you find you need them one day. Aging in place is more than just staying put in your lifelong home that is familiar to you. It is living in comfortable and safe surroundings that fit with your abilities. People of all ages and abilities value their ability to live independently. But in order to age in place successfully, it is important to plan ahead. Having a plan will help you stay in control of your life for a much longer period of time. Knowing your health risks and financial well-being are two factors that will greatly influence a person’s ability to age in place in a comfortable and familiar setting. Planning ahead to grow old in your home includes choosing a floor plan that is suitable for wheelchairs and walkers should you find you need one in the future. If you can afford to build a new home around with an eye on your golden years, you might consider an empty-nester house plan or even a handicap accessible house plan. Some people choose neighborhoods that offer a community driving service such as a bus of van to take them to the grocery store or bank should they find they are no longer able to drive. Others add ramps or lifts to access the entry door and add grab bars throughout the home making it easy to move around the home safely. Some add security systems that allow them to call for help if they should fall or become ill and are unable to get to a phone. Still others dedicate a portion of their finances to a savings account should they need to hire a healthcare provider, a laundry service, etc., to come into the home for regular visits should things become too hard for them to handle on their own. There are many things you can do in your own home now to make it ready for you to age in place when the time comes. Please watch for The House Plan Shop’s next blog, Aging in Place and How to Do It in Your Home for ideas on what you can do to make your home ready to age in place.